The Subway-to-Elevated Transition is a Transport building that allows Subway and Elevated Rail services to integrate and form one network. It was added in the Rush Hour Expansion Pack. 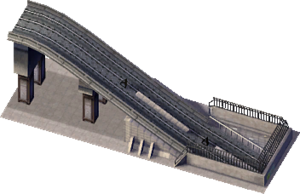 It is designed to be placed on top of both a stretch of Subway Network as well on a stub of Elevated Rail, allowing your Sims to transfer from expensive Subways to cheaper Elevated Rail. This page was last modified on 12 May 2015, at 06:58.